Well now that we’re home and comfy at our desks (OMG! I can sit at the computer now for as long as I want with NOTHING TO WORK ON! It’s an amazing feeling, really), I figured I could tell you how our Blizzcon went. This post is going to have nothing to do with announcements or tournaments, because honestly, I didn’t really get to see or hear any annoucements or panels first hand, just heard about them from friends. Firstly, I have to say that the cosplay dinner that we (along with Pocket) threw the night before Blizzcon was a huge success. We are so grateful to everyone who came out to the dinner, and we were so happy to finally meet all the cosplayers we’ve been following, face to face! Also, earlier that day Mario and I participated in a G4 photo shoot for the burlesque group that our amazing friend Lisa put together, it was really amazing to meet the ladies behind the group and hang out with them while we got pictures taken. So, even though I have decided that I will not put on Kerrigan until later in the day for the first day of Blizzcon, I am still showing these pictures the morning of! These were taken for the photoshoot, and later in the day I will try and post pictures of the updated version of the costume. We fixed the way the dreads lay, the forehead isn’t quite so high, the paint on the face is closer to what Kerrigan has, and the neck and ankles aren’t quite so loose. Enjoy! If you are at Blizzcon today, please look for me by the fountain around 3:00 or 3:30 at the cosplayer’s photoshoot! Well people, we can finally say that Blizzcon is next week, and finally, Kerrigan is (99.9%) finished! She is wearable in her current state, but we need to do some tweaking to make her more wearable and comfortable for myself so that I don’t die before the end of the day. Marked the cap under the cowl on where the dreads would go, and practice fit them. 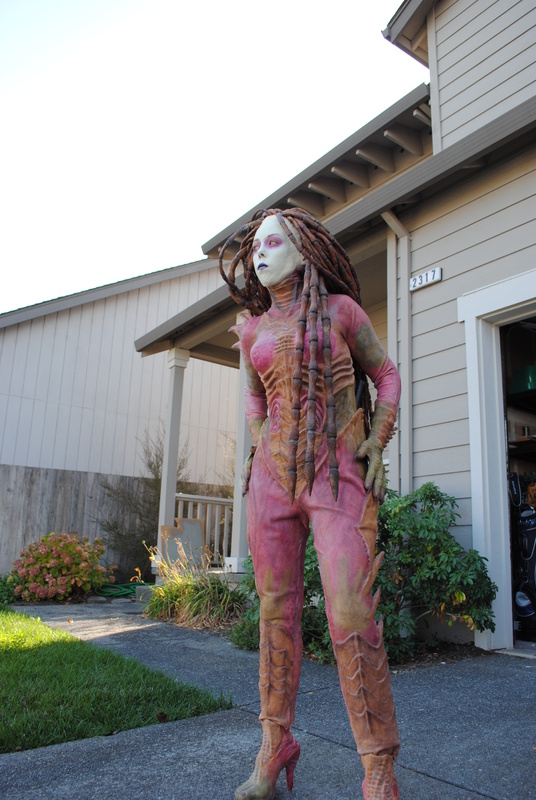 Had a 12 hour day where we did nothing but cast, seam, and paint dreads all day. Finally finished the dreads, and these aren’t even all that COULD fit into the cowl, just how many we thought we’d need to make it look nice. Inserted the dreads into the cowl and cap, one at a time while holding them in, the gently turned them upside down to epoxy them in. 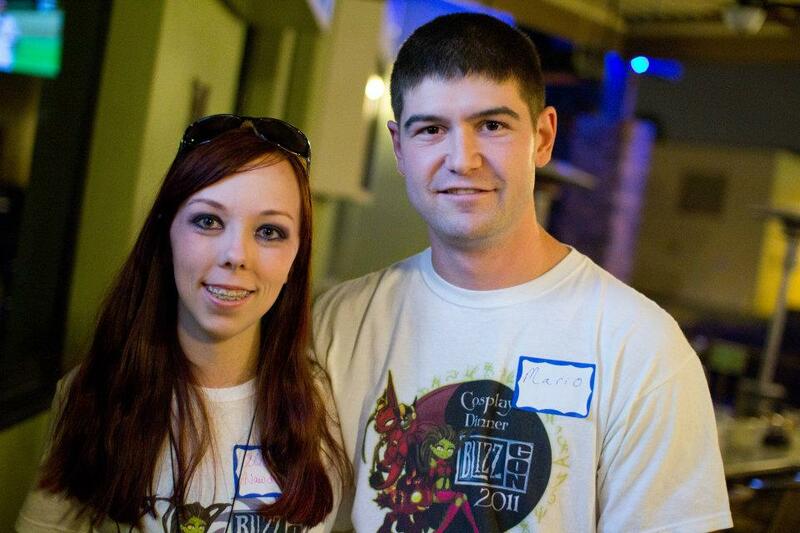 Just wanted to point out that this is the statue from Blizzcon, NOT ME lol. I’m likely doing a huge foam bumpit! We’ll see though. 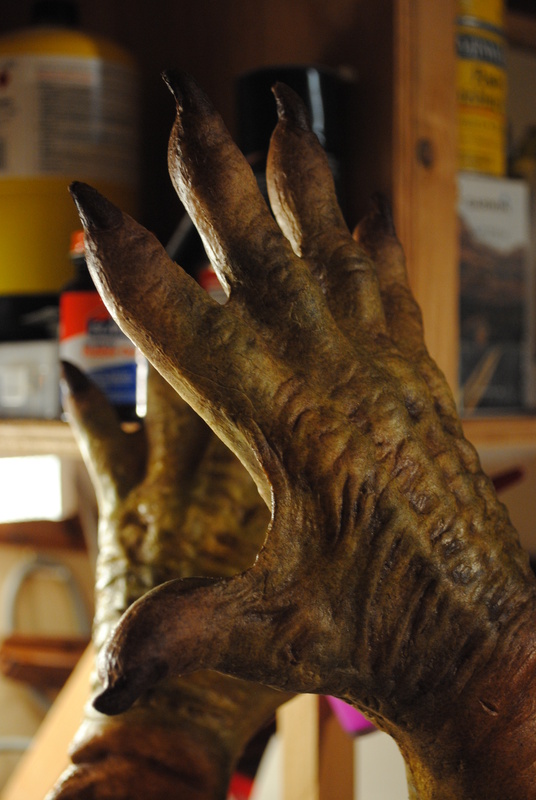 I painted the wings, and Mario finished painting the body suit, gloves, and feet. Well people, that’s my last update for Kerrigan! Come back on October 21 for some pictures of the completed design, though I’ll warn you now, that the dreads/cowl won’t necessarily look the same as the one I will wear to Blizzcon, but at least you can see the costume as it was for our photoshoot, and we will try and post more photos that night :) Thanks for sticking with us through our progress posts! Ugh, it’s October already. Blizzcon cannot possibly be this close! We really aren’t ready for it yet. 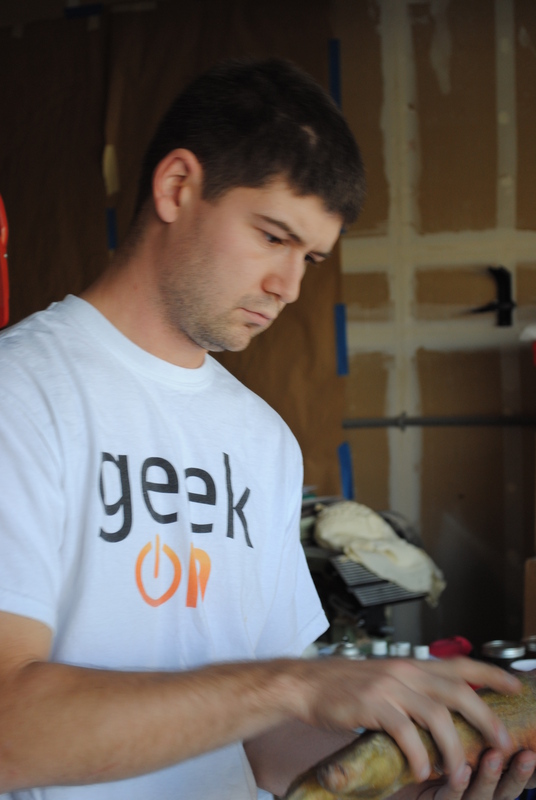 I like to get things done weeks ahead of time, and unfortunately that’s just not happening this year. 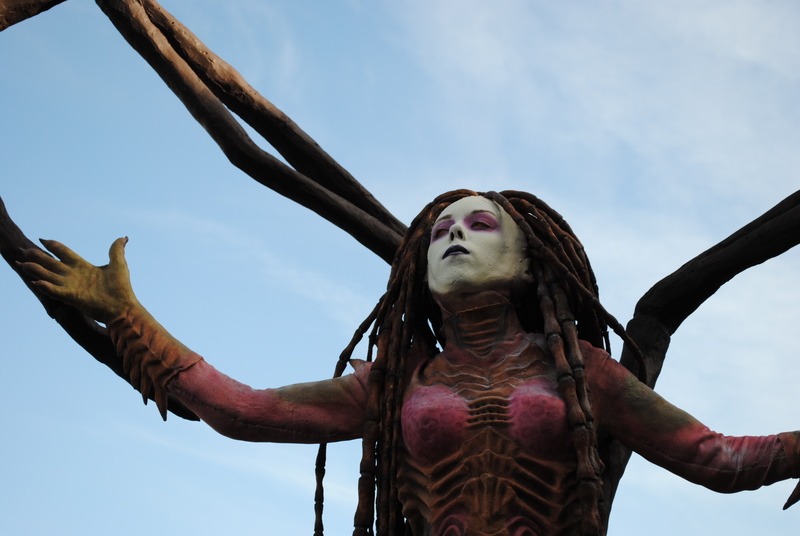 Kerrigan will be done by the end of the week (we ran out of dread material, and also the wings are taking longer than anticipated to shape and cover), and we will be doing the photoshoot on Sunday. 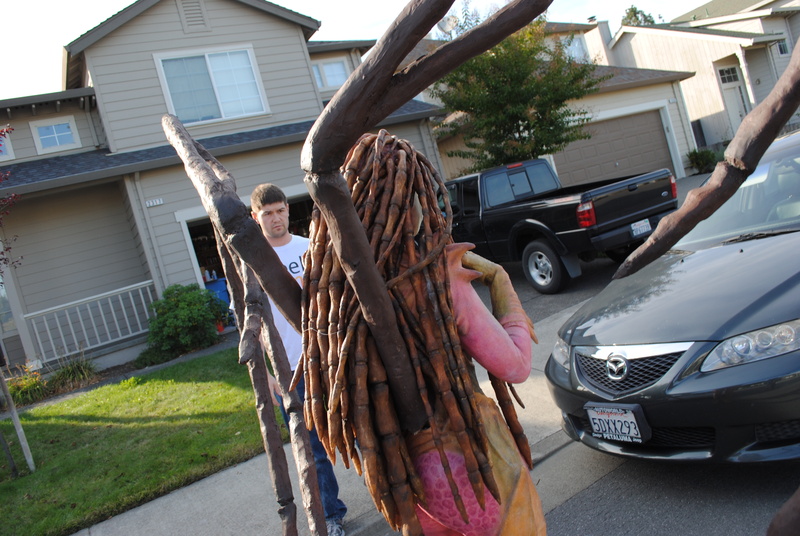 This past week, we: painted a whole lot, cast a ton of dreads, and worked on the wings. That’s really all that’s left, but even with working 12+ hours on this thing on our off days, it’s taking a while. We also want to make sure that we’re doing her justice and not ruining details by rushing. I was going to start painting the dreads tonight, but we need to hang them up to dry them, and we didn’t have anything for that. I’ll be building something first thing tomorrow. Oh! We also got in the mail the wonderful plushie hydralisk that Fiendle made for us! He’s wrapped in some of the dreads we’ve made in the picture above. 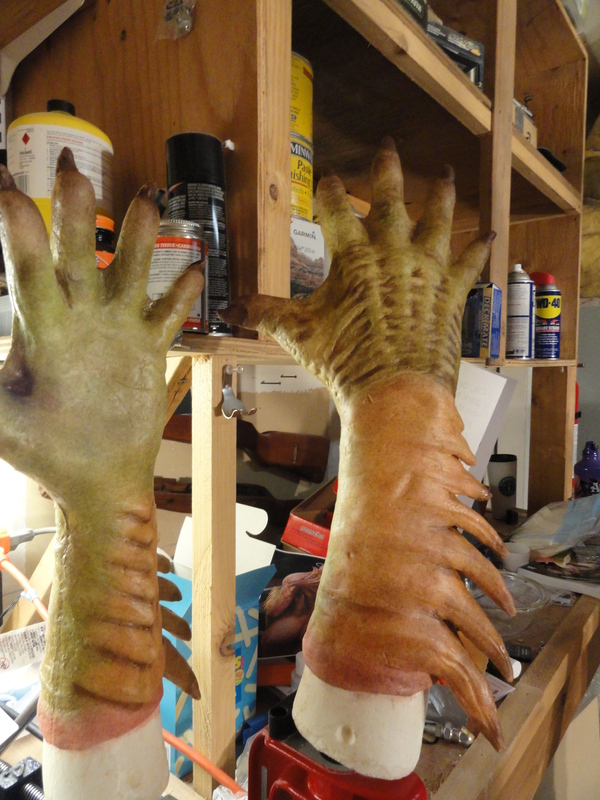 Since we haven’t been sharing much picture wise with you guys lately, have some not anywhere near finished gloves. 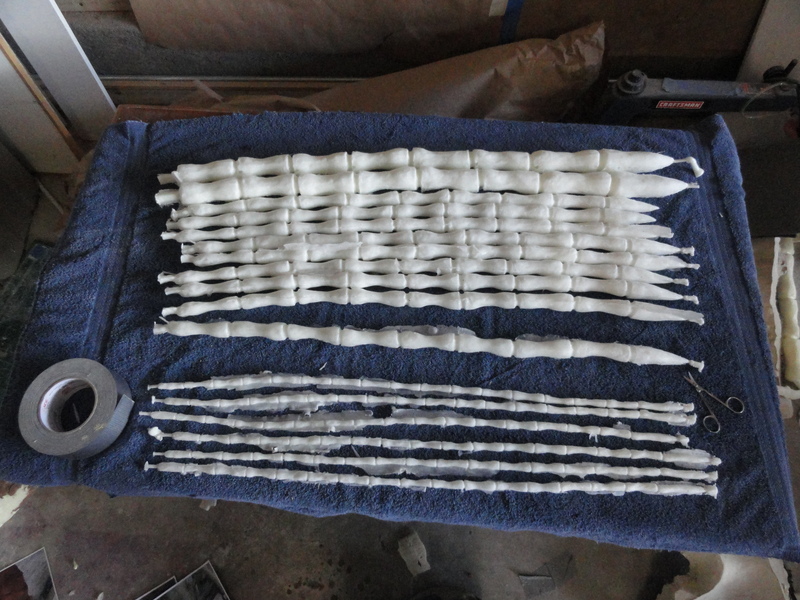 These are just the first base coats! 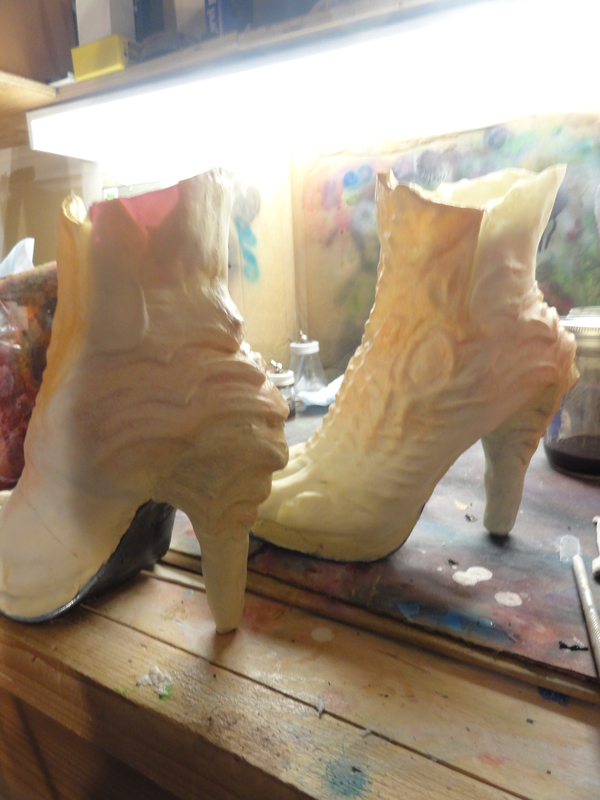 Another picture of the heels, Mario is painting those as I type! And finally, the dreads. 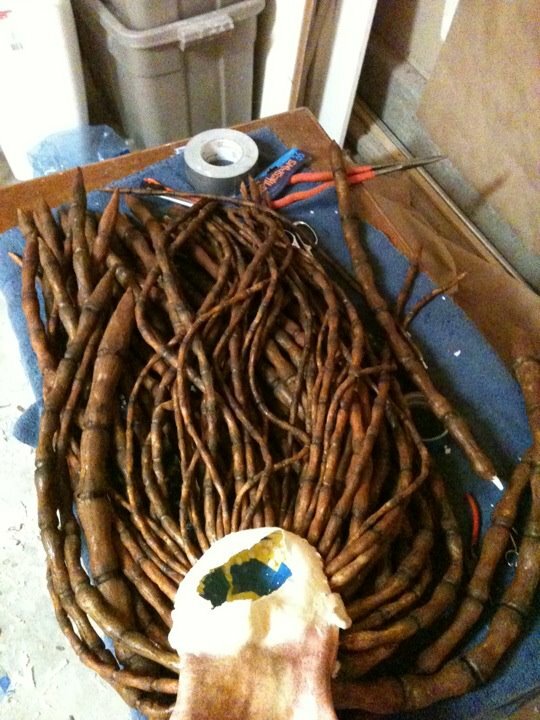 This is just the beginning of them; there will be probably close to 60 when we’re done, with 5 different size dreads. Oh! 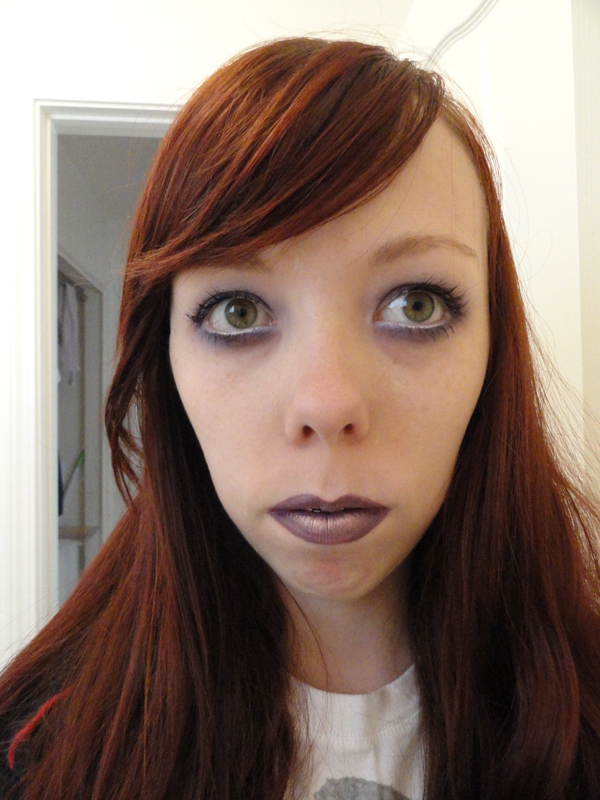 I also went to the mall to my local MAC counter looking for help to make my lips look more like Kerrigan’s, and let me tell you, that was the most amazing part of my week so far! The girls there were so nice to me, and the girl who did my makeup was so helpful, explaining everything that she did and they even wanted me to come back with pictures! 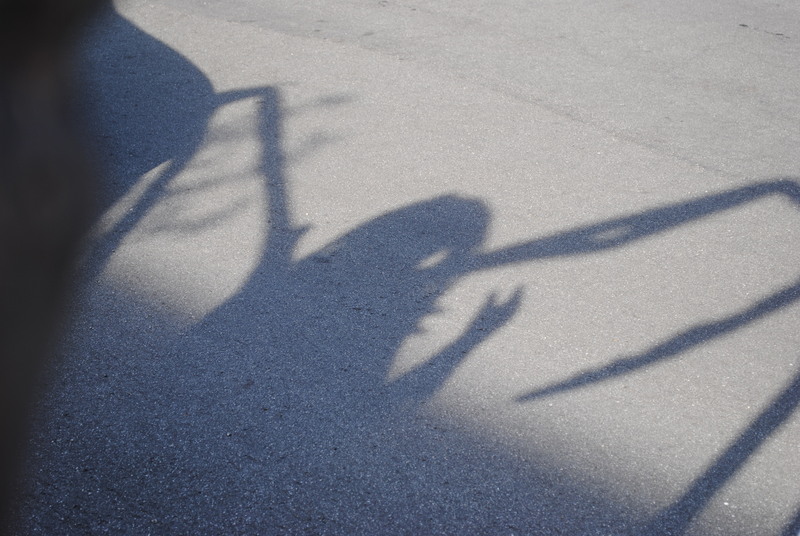 It makes me want to go there just to hang out and chat! And! 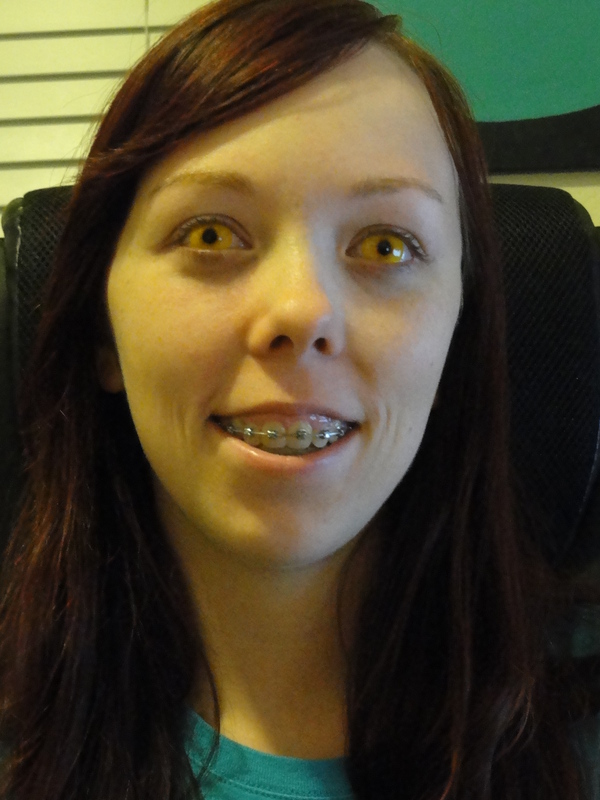 My contacts came in! How awesome looking are these! Well… that’s it for my last progress post! I’ll maybe post next week to tell how the photo shoot went, but I’ll post a completed picture of the costume on the day of Blizzcon, so that everyone who isn’t able to make it can see it then! Well… I really hope that this is my last update, and that next week I can happily report that this costume is finished. We’re pushing to get it done by Sunday, but I guess we’ll see. This week, we have to: finish painting the body suit, paint the gloves, shoes, cast the dreads, cast another cowl (we had issues), paint the cowl, make the spikes for the cowl, make the dread holder for the cowl, paint the dreads, attach the dreads, finish putting modelling paste on the wings, sand the wings, paint the wings, and done. This last week, we painted a lot of the body suit, finished the basic wing structure, covered it, carved the wings, and halfway covered it in modelling paste. 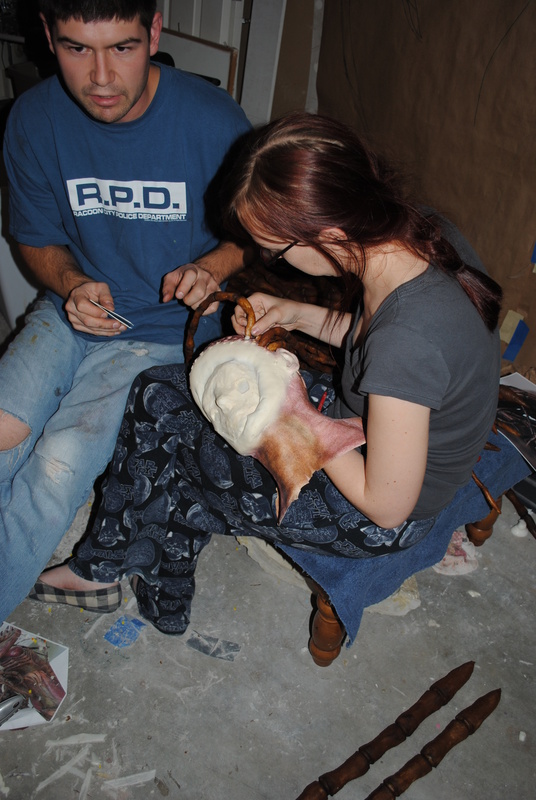 We also sculpted the heels, practiced gluing the cowl on, and tried to mold some dreads- but it was too cold outside, and they didn’t want to rise properly. 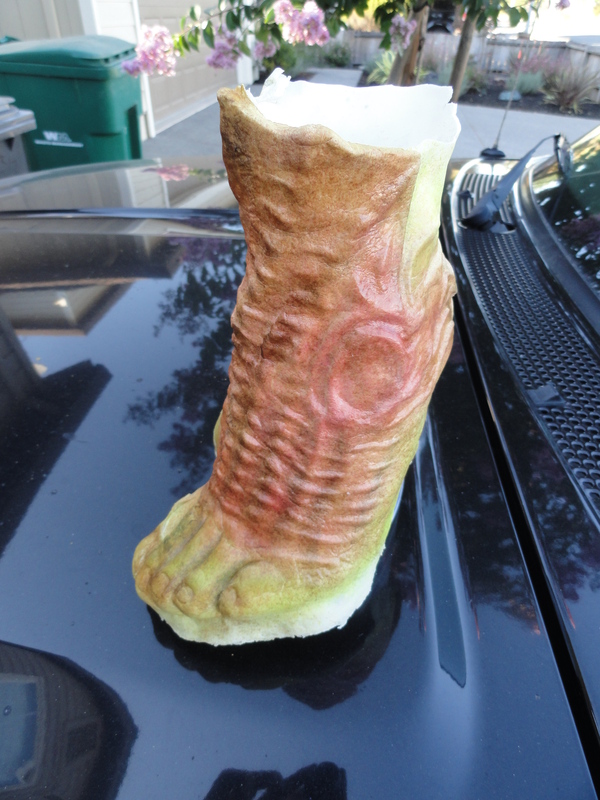 We also practiced painting the feet, with a spare foot cast we had. That’s it for this week! We’ll see if next week I announce that it’s finished! So, yes. We were out of town this weekend so not as much got done as we were hoping, and a lot of what got done was the wings, so.. not a lot of pictures, sorry. I’d say we’re around 95% done just because of the amount of stuff we’ve had to do to finally get to this point, today we start mixing paint and painting the pieces of the costume. 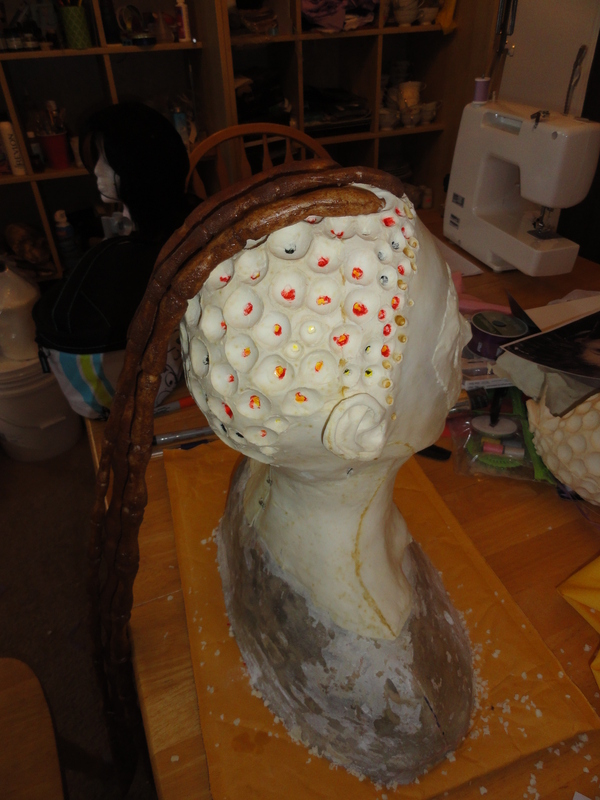 Two of the dreads are now molded, the largest and smallest. I think we were planning on molding the medium one yesterday but I had work and I think Mario forgot, or he needed the board, or something. 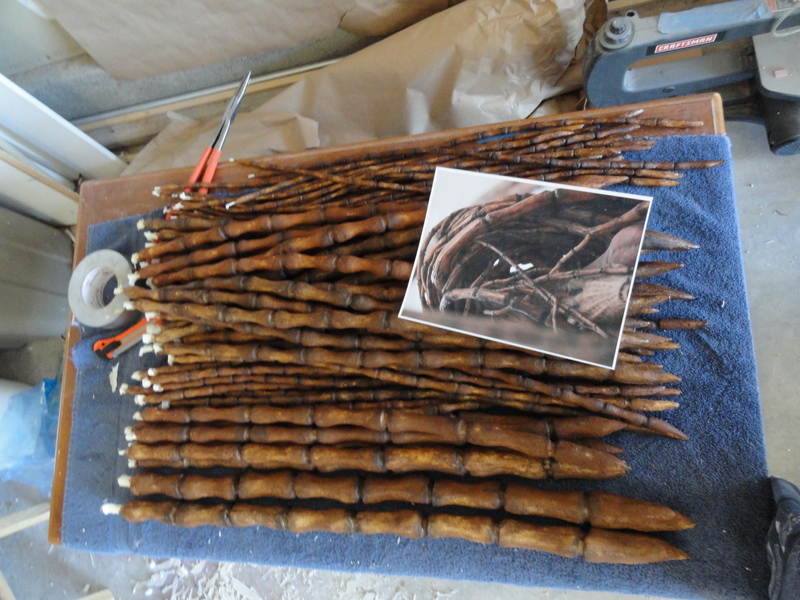 We have only one board we’re using for molding the dreads, so we can only do it one at a time. The wing structure is almost finished being built. It was really awkward for a while because I had to wear the corset in order for the wings to be worked on, so they weren’t completely still (those things just kind of do their own thing if I even breathe) (which isn’t a bad thing to be honest, it’s like they’re alive and moving) so finally Mario built a stand for the corset to be attached to and finally I can see what the wings actually look like without having to look at a mirror. So apparently this is the only picture I have to share this week, really sorry about that. 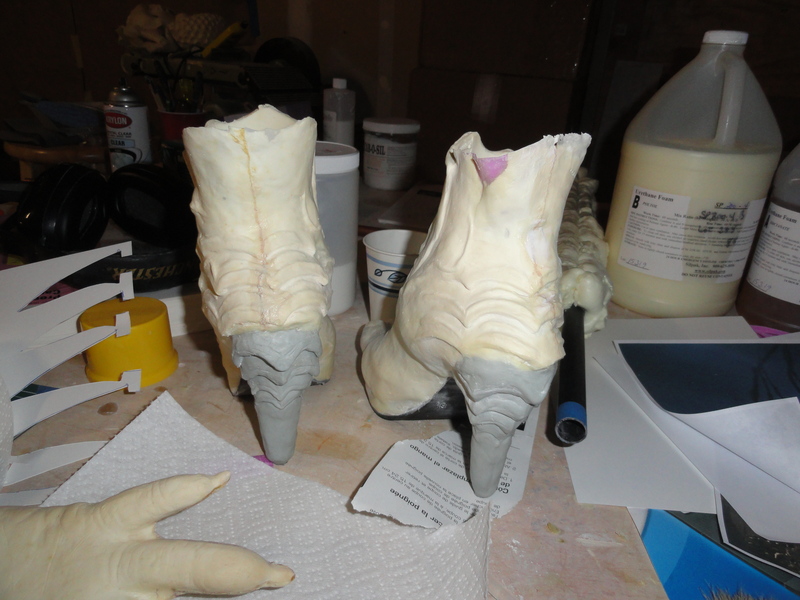 Started on sculpting the heels on the shoes, I think they’re coming along really well. 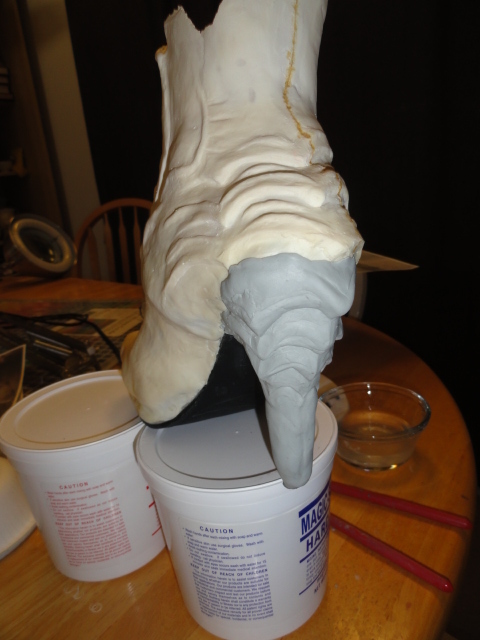 I’m using Magic Sculpt on the heels, easy to sculpt with and easy to sand and smooth. We also cast another cowl, and this one came out a lot better than the other one (the other one just didn’t have thin enough edges, we didn’t close it tight enough, so we put extra mold straps on this one). I’m excited to practice glueing the thing to my face! Well, that’s it for this week. Sorry that there aren’t more pictures to share. 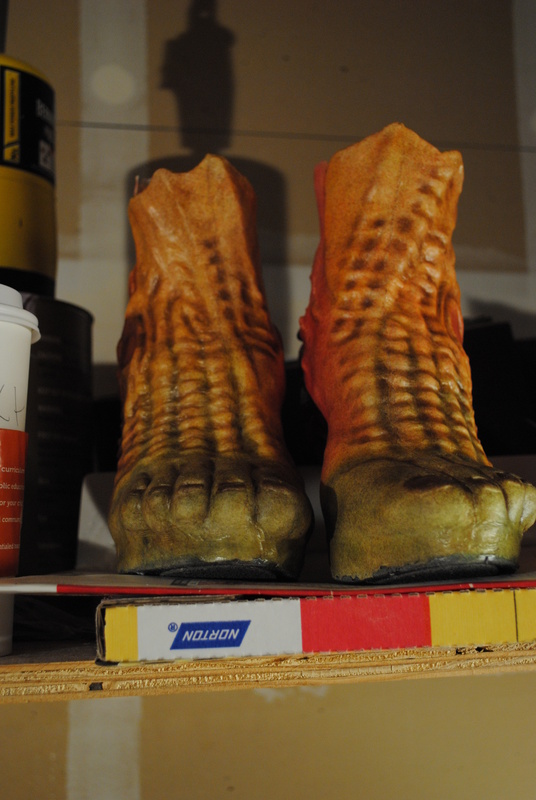 I’ve already said that once we start painting things, you’ll stop seeing pictures, but I might show the base coats. 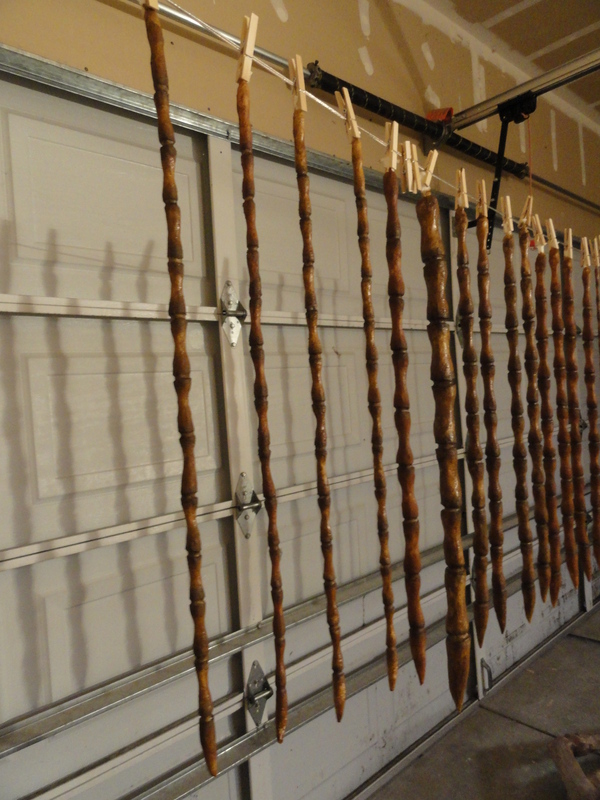 We are hoping to have all of this done in two weeks, so we’ll see! I hope everyone’s costumes are coming along well! We’re at a month to go til Blizzcon, people!